For most material collections, value is based on an items age, condition, rarity and a number of other factors. A pattern develops in which a particular brand is the most valuable or a particular design is most desirable. This is not the case in this cast iron collection which has not only a large variant in item types but are also a large variant in collecting values. In this collection there are many items which are very rare yet their value is nominal or low. And there are others where the value is extremely high although they are readily available. This may be due to the fact that some items are collected and are used by collectors as cooking utensils. While other items, which once served the purpose in the home, like stove pieces are purely decorative items. There is also a large collector community built up around items which are marked and numbered. This adds value as items are easier for collectors to find and trade. – Jill Harrison Fine Art and Antiques – Reprinted from the Collection Catalog. 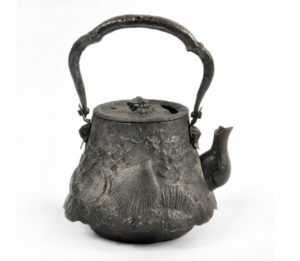 Photo: Tetsubin, Wabi-Sabi aesthetic, depicting scallop shell fragments, with sea snail iron tsumami iron lid top. Joel Schiff Cast Iron Cookware Collection, Museum of the Hearth and Kitchen • Website design and Collection photography by KathyChapman.com • Powered by WordPress.